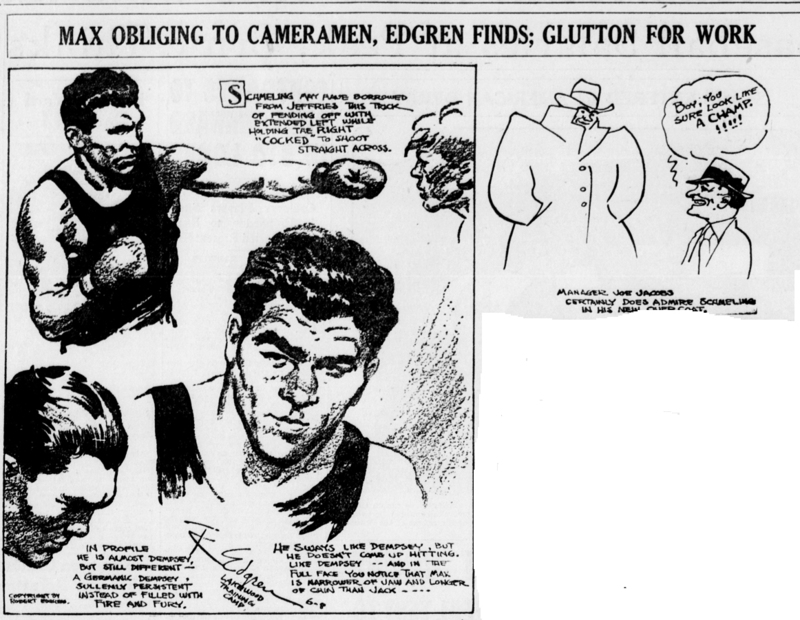 When my hack drove up to Max Schmeling’s training quarters on the Dwyer farm, a few miles from Lakewood, N. J., the first thing I saw was a large black haired young man bouncing up and down on a horse and a flock of photographers snapping and cranking cameras. "Hey,” yelled a photographer, "we want to get you coming down the track fast, as if you were in a race." Schmeling, who was on the horse, grinned widely as he got that idea. He turned his horse around, headed It down the track away from the crowd, and urged it to a gallop. In a minute or two he disappeared in the distance. Then he could be seen rounding the distance turning, this was on Mr. Dwyer’s private training track, a three-quarter mile course. Eventually Schmeling appeared coming down the straight away toward where the photographers were grouped. More snapping and cranking. He went bouncing by. Photographers yelled to him. Some camera men, it seemed, had arrived just too late to get the focus or something. But Schmeling didn’t stop. He rode all the way around the three-quarters of a mile again and flapped past the clicking shutters. And then He went right around a third time. Ile grinned as if he thought it a good joke — kidding tile camera men that way. But they stopped his horse and caught him. and dragged him of somewhere to be snapped lying on the ground beside someone s dog to show how he loves to play with animals while training. And they handed him a scythe, and told him to cut the long grass, so the world could be shown how he uses the most ordinary brands of farm work to develop his fighting muscles. Schmeling accepted tile scythe and turned it over in his hands, curiously, and finally decided which was the handle and which way the blade was supposed to be pointing, and he swung it experimentally. Billy McCamey looked on nervously, but Max didn’t cut himself. He didn’t cut any grass either, but that detail probably didn’t show in the pictures. Next the photographers, snapshooters and moving picture operators both suggested that the public might be interested in seeing how Max swats a mighty clout from the tee. The camera men assured Billy that Max was posing exactly like a golfer, and if not, who’d know the difference? The snapping was finished and Max swung softly at the ball and hit it over into the yard back of the kitchen. Then they handed Schmeling an axe and pointed to a large log. Max seized the axe, stood behind the log and chopped a t it vigorously, left-hand and right hand. A couple of chips flew, and a few pieces of bark. A small dent appeared in the log. Shutters clicked. Other photographers came running and directed Max to do it over again. Max was led back to the house and sent to dress for his boxing. He had been posing for pictures for about four hours. Whatever other qualities this young German has or lacks, he is the most patient boxer in captivity. Gene Tunney would have walked inside and locked the door behind him just about three hours and 50 minutes earlier in the day. Schmeling may not be adept at all the "stunts” customarily pictured to the credulous public as part of every fighter's daily workout, but he is quite active enough in his own way. He likes to walk three and a half miles to town and walk back again. He had McCamey crippled and blistered before they’d been at the training quarters three days. he runs around the horse track, which is soft and dusty and gives him a good workout for the legs. He is on the move every minute. Fat didn’t grow on him when he was out of the ring four months. A flash of sense in this. No bunch muscled fighter ever had a punch. Max seems to like his boxing best of all the exercises. Movie cameras grind around his raised ring, and shutters keep snapping, but he doesn’t have to pose. He just boxes along to suit himself. I won’t say that Schemling compares in any way with Jack Dempsey, so far as action is concerned. He looks like Dempsey and he tries to sway from side to side in Dempsey fashion, and he hits just a little bit like Dempsey. That is to say, he hooks punches and tries to put a "sock” into them. He does sock, at that. He drives a mean almost straight right. This was the blow that finished Risko, and Max usually has hils left hand out pawing around to fend an opponent off and perhaps feel for an opening, while the right is persistently "cocked,” ready to be driven on its way. On his feet Schmeling lacks Dempsey’s smooth and slippery grace. He is a little stiffer and awkward, but fairly quick in getting around. His hands are better. He hits accurately, hits often, fast enough, and seems to have I. lot in reserve to use when he wants to let it go. He wants to figure his movements. None of the lightning fast thinking and headlong movements that made Jack a terror among fighters. Schmeling has a powerful neck, strong shoulders that slope a little, good arms that aren’t too heavy, a good small body and round hips and legs. His wrists and hands are good, but not by any means the battering ram s Dempsey packed around in his day — hands and wrists developed working on railway gangs, in mines and construction camps. McGarney asserts that the beer is great in Germany, but Max never indulges, never smokes, and has marvellous habits for a fighting man. Max won’t even pose with a fair haired lady. One of the photographers brought one out to the camp and asked Schmeling to pose before the camera standing beside her and gazing soulfully into her eyes. This one favor he refused promptly and with emphasis. He reads the papers and knows all about how photographs are likely to pop up years later In half million dollar suits, and he isn’t going to imitate a noted retired champion, who has figured prominently of late in the news. McCamey says Max had one harowing experience on the late trip to Germany. As the steamer docked a crowd of photographers called for Schmeling. He stepped to the rail to face the battery of cameras. Just as everything was about to click a European moving picture actress slipped up close beside Max and spoke to him. Max turned his head and looked down, and at that moment the cameras snapped. Result, a picture with a beautiful blonde The lady had copies of the photos distributed all over Europe within a few days, and coyly admitted in interviews that she had found Max delightful company although Max had never seen her until he turned his head at the steamer rail. So Max isn’t going to pose with any more blondes.